The countdown to the first day of school is winding down to days rather than weeks now. I’m frantically checking and rechecking To-Do lists. I may have developed some clinical anxiety over this whole life-change thing. I sense the great potential for our fragile morning schedules to nose-dive off a cliff with the resultant ball of fire if there isn’t some serious preparation done beforehand. I have to get a grip on something. I can’t control a whole lot of things, like how much homework we will have or if the kids socks are just going to feel “wrong” that day. To keep my desperate grasp on sanity the best course of action is for me to have to make as few decisions in the mornings as possible. This translates to preparing a whole bunch of stuff beforehand, from clothes organizers to breakfasts. I spent all, and by “all” I mean every spare minute, getting heat-and-eat breakfasts and freezer meals ready last weekend. 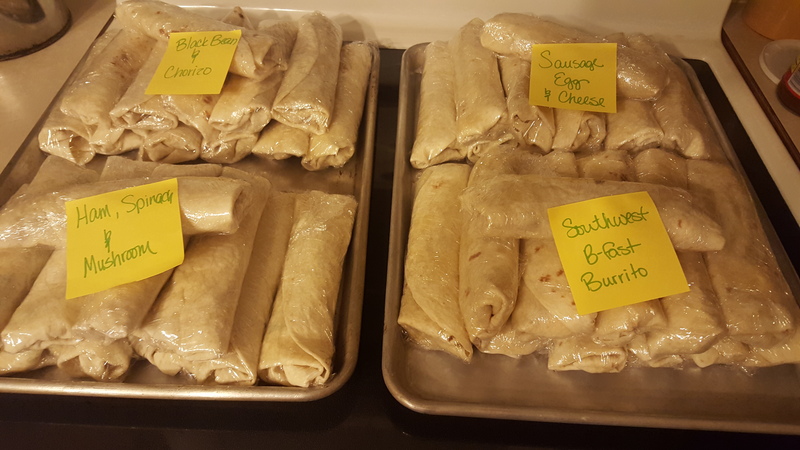 Some other moms are doing the same thing, so I thought I’d share my ingredient lists and few tips for the breakfast burritos I made. This is not a food blog, but we get pretty ungraceful around here when we are hungry, in a hurry and flustered. I’m really, really bad at doing step-by step directions. Here are my ingredient lists for the four kinds (yes, four!!!) of breakfast burritos that are now sitting happily in my top freezer basket just waiting for the first day of school. Note: the measurements for ingredients are estimated. Add or subtract as you see fit. The process for each one is essentially the same. Cook the meat and set it aside in a large bowl, saute any fresh ingredients (and potatoes) in the same skillet, set that aside then cook the eggs. Mix them all together and add the cheese while it’s all still hot. I used a 1/4 cup scoop to fill and put 2 heaping ones in each tortilla (a little more for the southwest because of the potatoes) Once your burritos are filled wrap them tightly in plastic wrap. Save the resealable tortilla packages and use them to put the finished burritos in. Reserve your bacon grease to saute your vegetables in. Fill each with a 1/2 to 2/3 cup of filling. I forgot to add the salsa in the Southwest so I didn’t include it here, but 1 cup should do it if you love your salsa like we do! Use two large bowls: one bowl will be cooling while you are cooking the next one. Experiment! Meat, veggies, eggs and cheese – the options are endless! How do you prepare for school? What is your most helpful trick or tip?